Often, we get to know about the hardships faced by the people in Africa through newspapers and television, and we wonder: How can we help them? How can we make their lives a little better than yesterday? But most of us do not find enough time or courage to do anything about it. Intercultural Open University Foundation/Universidad Azteca/Central University of Nicaragua alumnus Teresa Ngigi PhD is not one of them. She is one of the few people who has taken it upon herself to positively change the lives of children in Africa. She is currently working in Sierra Leone as the lead psychologist in crisis management. Sierra Leone is a country in West Africa along the Atlantic Ocean in the west. Its capital city is Freetown which was established by British Abolitionists and Philanthropists as a safe haven for repatriated and rescued slaves in 1787. It came to be a British colony in 1808, and then a British Protectorate in 1896. Independence for Sierra Leone was achieved in 1961. Sierra Leone is a one-party state, but in 1985, multiparty elections devolved into a devastating 11-year civil war, leaving approximately 50,000 people dead, a third of the population displaced, and destabilized families and communities. In 2014, the country was plagued with the deadly disease Ebola which devastated the population further. In Dr. Ngigi’s interactions with the local people, an amazingly large number of people have alleged that they would rather live through war than Ebola! They said that they could find ways of escaping from the war, but Ebola swept across regions mercilessly and no one could escape its grip. This is how overwhelming the disease was to an already ailing, traumatized population. When Dr. Ngigi arrived in Sierra Leone in September 2016, she was troubled by the destruction of the civil war–bombed out buildings, half completed structures, and vast devastation. She started working with SOS Children’s Village in Sierra Leone. SOS has three villages (Freetown, Makeni, and Bo). Dr. Ngigi and her team addressed the needs that pertain to trauma and counseling. They train mothers and aunties who care for close to 450 children hosted in the three villages, as well as teachers in the three SOS Hermann Gmeiner International Schools. These schools have a total of about 2800 students from Kindergarten, primary through secondary level. Dr. Ngigi trains schoolteachers and staff on how to handle traumatized children, anger management, team building, and other psychological issues that affect them. Dr. Ngigi also works with the youth in the three youth facilities (a total of about 110) on an individual basis as well as group sessions. She instructs and supervises Social Workers and Youth Supervisors. She and her team are engaged in family programs where they work towards creating and enhancing children and youth’s relationships with their biological relations. They have designed a transition program whereby they have crafted what needs to be in done in the different transition stages for children and youth, as well as co-workers in general. 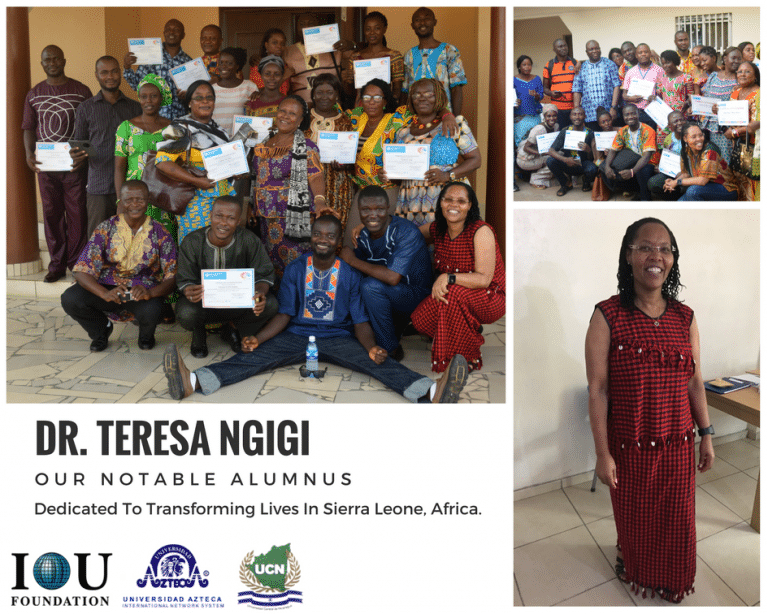 IOUF and its consortium partners UCN and UA are proud of the achievements of its alumnus Dr. Teresa Ngigi. She truly embodies the idea of one person’s ability to make a positive impact on the world.